Hello! 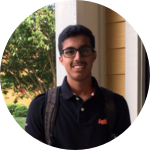 I'm Ananth, and I'm the president of our iGEM team. I have a great love for synthetic biology, the medical field, and clinical research. I hope to pursue a career in the field of medicine.